Dental implants are widely considered to be the most effective restorative dental solution for patients who are missing one or more teeth. 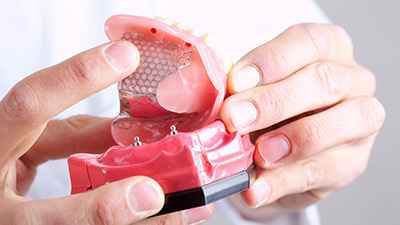 In cases in which a patient is completely edentulous -- or missing all of his or her teeth -- a procedure known as All-on-4 dental implant placement may be recommended. This revolutionary restorative process allows patients to replace an entire arch of missing teeth using just four dental implants, all in a single visit to our practice in Las Colinas, TX. Why Choose 21st Century Dental for All-on-4? Dental implants are biocompatible posts that are surgically placed within the gum tissue and bone of the jaw. These implants serve as the sturdy anchors to which a beautiful new restoration is securely attached. With the All-on-4 concept, only four dental implants are needed to support a full prosthetic arch of custom-crafted teeth. Due to their strategic placement and tilted orientation within the bone, All-on-4 dental implants can even be placed in patients with minimal bone volume in the jaw. Following the placement of the implants, the patient’s new prosthetic is loaded immediately and assessed for a proper fit and total comfort. The ultimate result is a beautifully transformed, completely restored smile with unparalleled functionality. Patients are once again free to eat their favorite foods, speak with clarity and confidence, and show off their smile knowing that they look as good as they feel.